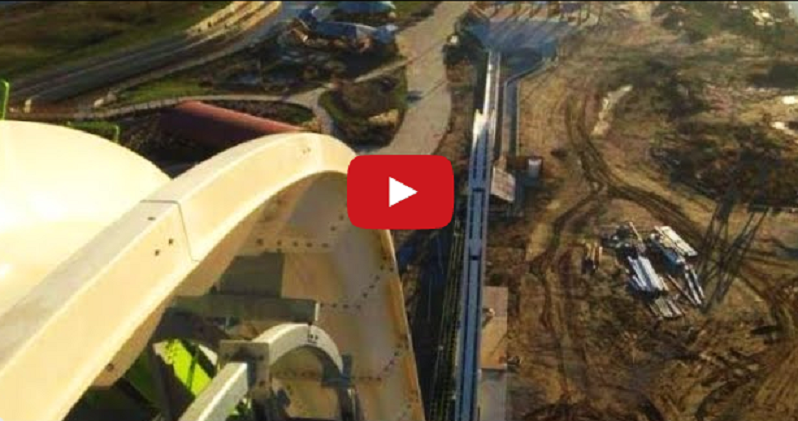 LOOK: The Worlds Tallest And Fastest Water Slide. The Verruckt Meg-A-Blaster is being called the world’s tallest and fastest waterslide, and the Kansas City waterpark company building it claims it will shatter existing world record. The new waterslide at Schlitterbahn is expected to shatter the current record for height held by the 164 foot high Kilimanjaro in Barra do Pirai, Brazil. Verruckt means “insane” in German, and the slide is scheduled to debut next year. It is definitely not for the faint of heart. Adventurous souls must climb an agonizing 264 steps to reach its staggering 17 story tall top. Four person rafts will send them hurtling back down to Earth at a minimum speed of 65 mph. The ride includes a five-story hump that shoots riders upwards as a climatic finish to what will no doubt become known as a “bowel-loosening” attraction. Company officials have been keeping quiet on the exact height of the slide until they have a chance to consult with Guinness World Records.